Easter is a great time to spend some fun time with the kids doing art and craft activities. Even the little ones, with a little help can manage this fun one. Pom poms are quick to make and you only need a few simple things probably handy in the craftbox. 1. Cut out 2 matching doughnut shaped pieces of cardboard, to suit the size of pom pom you wish to make. 2. Cut wool into lengths of about 1 metre. 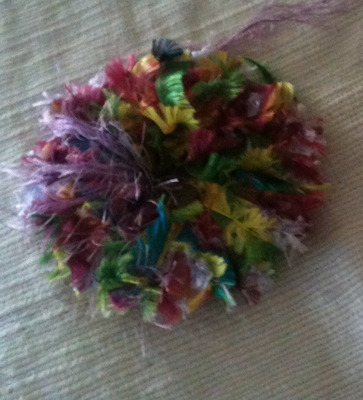 The thickness of the pom pom will determine how many you need. 3. Put the 2 pieces of cardboard together and tie off a piece of wool to it. 4. Start wrapping the wool around the doughnut going through the hole, around the outside and back through the hole. Keep repeating this until doughnut is thickly covered to make a nice fat pom pom. When near the end of a length of wool simply tie on the next piece with a secure knot). 5. The next step is best done by adult if you are making the project with the littlies. Holding the doughnut firmly, poke the scissors in between the 2 sides and cut around the outer perimeter of wool. 6. Slide another length of wool between the 2 sides of the doughnut and tie off. This is sometimes easier with some help. 7. 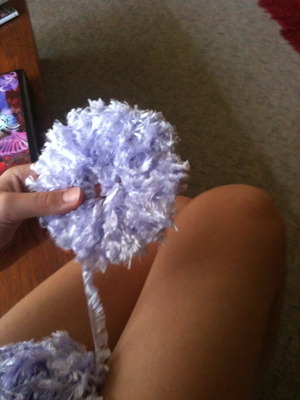 You can use a piece of wool long enough so it can be used to tie your pom pom where you want it to go. Looks really cute as a fluffy Easter Bunny tail. Make yourselves some matching Bunny ears and have a wonderful Easter!